Would you like to join us at Scripture Memory Camp? Young people who memorize SwordGrip can come for free and enjoy a wonderful week of swimming, boating, zipline, paintball, crafts, good fellowship, singing, and—most importantly—an emphasis on God’s Word. See scholarship details below. Scripture Memory Camp is designed for the young and the young at heart. Scholarships for completed memory work are available for memorizers age 3-18 (details below). Scripture Memory Camp is at Southland Christian Camp in Ringgold, Louisiana. (Learn more about Southland’s camp facility). We are willing to consider hosting additional camps in any geographical region where there is concentration of memorizers. Children and teens stay in dorms with counselors for the full camping experience while adults relax in the lodge or hotel. (We also have housing facilities for parents and their children who would like to lodge together). Children ages eight and under must lodge with parents or sponsors. Camp will be held Monday-Saturday, July 1-6, 2019. For campers 18 and under who memorize the age-appropriate number of SwordGrip verses, camp is free — just pay the $25 deposit. See scholarship options and details below. Otherwise, you can pay full price. Full Price: Ages 3-8: $150; Ages 9-18: $200; ages 19 and up: $240. Campers 2 and under are free. What You Do: Memorize all the SwordGrip verses for your age level. Preschool through 2nd grade: memorize all 28 green verses; 3rd through 5th grade: memorize all 55 green and blue verses; 6th through 12th grade: memorize all 82 green, blue, and orange verses. Once your memory work is complete, recite all your verses in one sitting to a pastor or other leader at your church. Then, email your signed certification form to contact@scripturememory.com no later than June 17, 2019. What You Get: Camp is completely free! Just pay the $25 deposit to secure your spot. 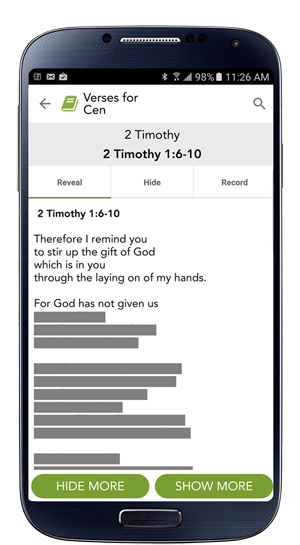 What You Do: Memorize as many verses as you can from SwordGrip. Once your memory work is complete, recite all your verses in one sitting to a pastor or other leader at your church. Then, email your signed certification form to contact@scripturememory.com no later than June 17, 2019. What You Get: For each verse you're able to recite in one sitting, you'll receive $2 off the full price of camp. For example, a 16-year-old camper who recites 50 verses would receive $100 off the full price of $200. A $25 deposit is required. Registration is now open! Click below to secure your spot. After May 15, a non-refundable $25 late fee will be added to each registration. No registrations will be accepted after June 14. If registering a group of campers, contact us to request a group form.